Below is the Summary of​ the​ thesis paper​ from Dr. Sheryl Satorre entitled "Technology Startup Ecosystem in Cebu City, Philippines​". The study assessed the status of the technology startup ecosystem in Cebu City, Philippines during the Calendar Year 2015, to plot out a local technology startup ecosystem canvas. It is a descriptive research that utilized survey questionnaires, structured interviews, content analysis, focus-group discussions, and non-participative observations. There were fourteen (14) startup founders, ten (10) mentors, and seven (7) university representatives as respondents of the study. Snowball sampling method was used to identify the samples of startup founders and mentors. Startup ecosystem elements examined in the research were the Founding Team, Startup Capability, Support System, and External Environment. The research revealed that local infrastructure is not conducive for startups, and there is no visible support from the local Cebu City government. Additionally, Cebu City has a dynamic set of business and technology communities that promote development at the grassroots level but lacks a platform that would scale up to the next level. Based on the significant findings of the study, it is concluded that Cebu City technology startup ecosystem is less vibrant. Furthermore, it is recommended that the local technology startup ecosystem canvas, which is the output of the study, be publicly available and regularly updated in order to help the newcomers. 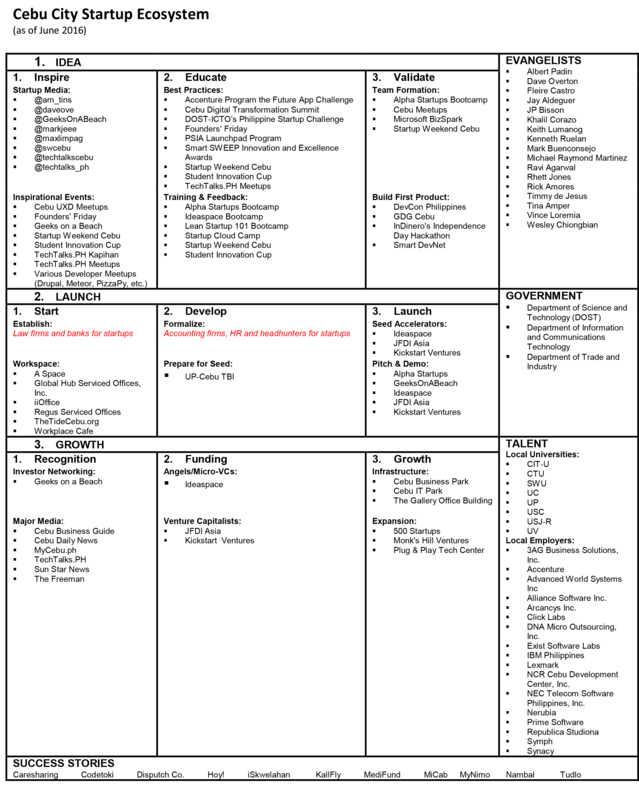 Please click HERE to see the latest version of the Cebu City Startup Ecosystem Canvas. 2) If you are a startup based in the Philippines and want to be listed on startupPH.org, please click HERE. Sheryl B. Satorre is an I.T. professor at the University of Cebu. She is sharing with you a couple of documents generated from her PhD Thesis entitled "Technology Startup Ecosystem in Cebu City, Philippines", wherein Tina Amper, founder of TechTalks.ph, served as one of her advisors, along with Dr. Cecilio S. Baga. 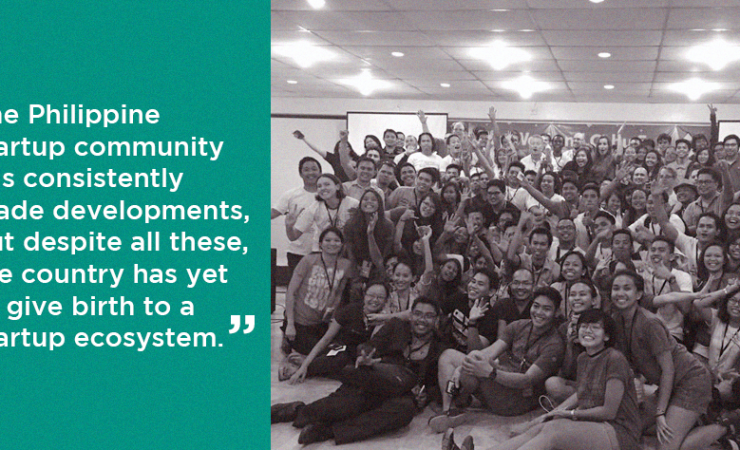 Protected: What makes TechTalks.ph tick? Who are we? TechTalks.ph is a non-profit, independent community of business, technology, and startup enthusiasts. Members meet to share ideas, learn new skills, and discover growing opportunities in the field of technology. 2011-2015 © TechTalks.ph. All Rights Reserved.